Ultrasound uses sound waves to detect differences in tissue density. The adaptation of Ultrasound techniques to equine science has revolutionized the veterinarians ability to diagnose and treat soft tissue injuries. With the use of Ultrasound, it is possible to see inside the soft tissues.Ultrasound allows veterinarians to image a large number of soft tissue structures in the horse. In an ultrasound, the veterinarian holds a transducer against the horse's body. The transducer emits high-frequency sound waves. The veterinarian slowly moves the transducer over the area being examined. The sound waves bounce off internal tissues and organs. Tissues of different densities reflect sound waves differently. The transducer separates and identifies the sound waves, 'echoes'. The echoes are then converted into electrical energy. Complex equipment uses them to produce video images called sonograms on a computer monitor. Sonograms can be recorded and transmitted. *Ultrasound can be used to image the heart, lungs, kidneys, liver, spleen, and intestines, even during colic episodes. An ultrasound of a mare's reproductive organs can show an embryo at just 12 to 14 days. In contrast, rectal palpation usually cannot detect pregnancy until 30 to 35 days. By day 25, ultrasound can reveal a heartbeat to verify the presence of a viable fetus. 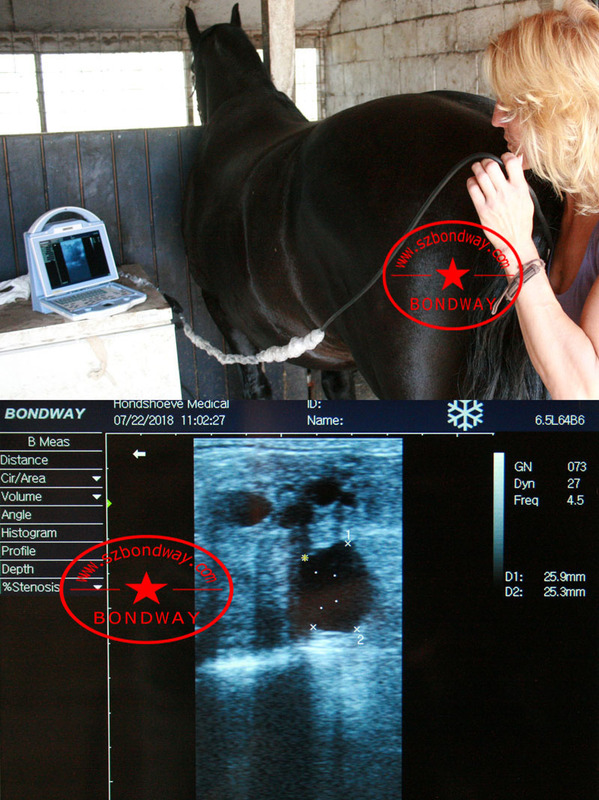 Equine ultrasound diagnosis requires highly specialized solutions. It is important to understand what you will be using your system for and the capabilities of the solution prior to making a purchase. *Tendon imaging requires high resolution, near field scanning along with precise and easy to use measurement tools. *Abdominal and cardiac imaging requires significant ultrasound penetration to Depths up to 35cm or more. *Cardiac imaging In addition to requiring excellent Depth, it requires excellent resolution along with advanced imaging features likeColor Doppler and deep penetration phased array transducers. BW560V, BW570V, BW520V, BW540V etc are a good choice for this application. Please contact our salesman if any questions you have, and we'll recommend you a right product with right probes according to your actual application and budget.